Automatic eyeleting machine, electric motor, (available also as pneumatic version Mod. M11C-P) for eyelets with shank diameter between 1.5 and 12mm on pre-punched or soft material. The feeder, easily interchangeable allows to set every kind of eyelet. 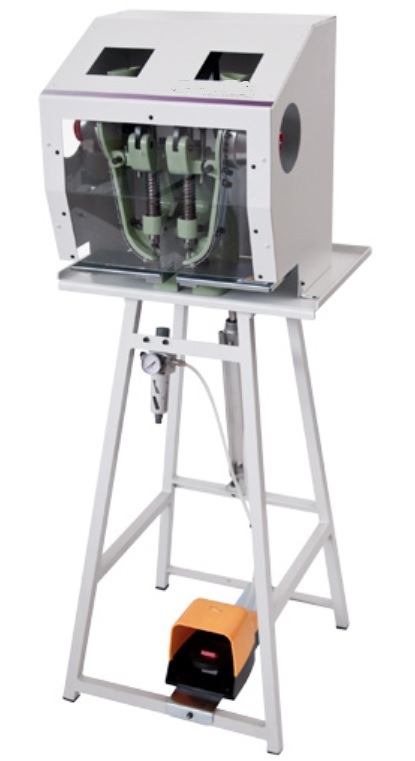 This machine can be used as semiautomatic for snap fasteners. All the functions are under the control of a microprocessor, a partial counter with reset and a total counter are available. Among the options a slow motion for TEST and a MULTIPLE SETTING to repeat a programmable sequence of a certain number of eyelets and the time between the setting. This machine can be transformed as riveting machine or upgraded with the lower feeder to reach fully automatic machine.